Not sure if this is a Smash 4 Port, or a brand new Smash 5. With the details coming out (Inklings as playable characters, Breath of the Wild-style Link), it sure seems like a brand new game. Hopefully not a port, but if it is then it had better include all of the 3DS exclusive content as well as completely new stuff. That would be fine for now. I also hope it isn't a super late release. I think it's a new game the same way Splatoon 2 is a new game. So, like most sequels to multiplayer games. Honestly can't say I'm excited at all for this though. I feel like I've done this general "omg this game has Johnny Bravo in it HYYYYYPE" song and dance too many times so it's just kind of whatever. Gotta say, I'm a little disappointed that they didn't just have the paint form the logo. I barely played any of last gen on account of it being a Wii U game, so I'm all for this. ...But I'm also glad that they got this announcement out of the way in a random March direct, because that presumably means they still have something bigger for the one around E3. Gimme that Pokemon Switch already, guys. Damn, we unironically need an M rated Mario game. I seriously need to stop letting things get between me and getting a Switch, otherwise I'm not getting any of the games I want for it. I said it on twitter and I'll say it here-- let me know when it has a confirmed adventure mode, then we'll talk. 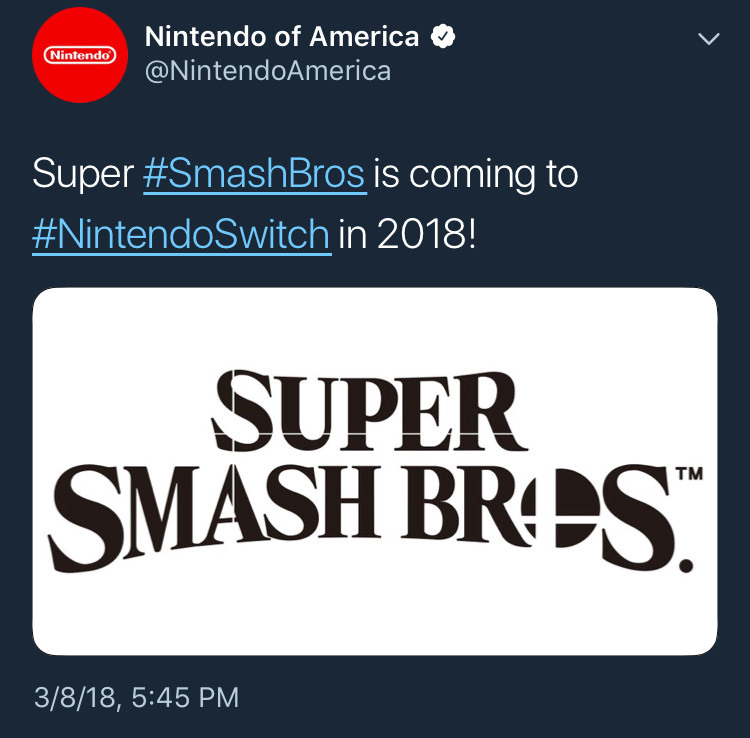 The 2018 release date is the only thing pointing me towards "port of Smash 4", unless they were just able to keep this development really well under wraps. We can embed videos again!? I mean, they were standing pretty far away. They were probably just doing their own thing and happened to bump into all the Smash characters. I'm not opposed to Splatoon characters' inclusion but they are taking potential spots for better or more deserving Nintendo characters, like Dixie Kong and Waluigi. I hope we get a ton of 3rd party surprises. Knew they'd go for Inklings this time around. After looking at a new article by Shoryuken about SSB I was led to a another that's a couple years old but worth looking at. To sum it up, Sakurai seems to be expressing sentiments which could hint toward the new SSB inching toward being more competitive again. I think SSB4 did a decent job of that already but the game could certainly benefit from increased speed. All of the games are competitive.